In the tradition of Tolkien and Asimov “The Elfkin Journals” invites you to step into new worlds of thought! Elves, romance, adventure and the magic of unlimited thought to spark your imagination! Warder Garith De’ Graoin and Doctor Lan De Tian lead a team of “Misfits” on a quest to save their universe from a plague that is sweeping through an entire civilization. Utilizing the power of bonded mind stones, they shape the energies of the universe to reach across time and space seeking out the enemy.As the most elite team of Warders in the Elfkin Federation… they are assigned the responsiblity to enter an alternate universe… find the weakness in the aggressor’s system and stop the plague. Unfortunately, the enemy they face possesses genetic mutations that make them the equivalent of ‘minor gods’.Tragically, this team knows that the reason their universe is under attack is the result of their Federation meddling in the affairs of the alternate universe. To win… they must save ‘the Mother’, defeat a minor god, and restore order to the alternate universe.What can this tiny team of 7 multi-racial Elfkins do against an entire Empire?WIN! They either win or two civilizations will devolve into primal chaos.From their tiny resort camp on the third planet from a minor sun… they must embark on a journey that does not understand the concept of time as a linear progression. They must win a battle using the curvature of time and the energies of two universal sources. In this battle there is no safe place to hide… your dreams, your future, your past… even the shadows of the night are all susceptible to attack. 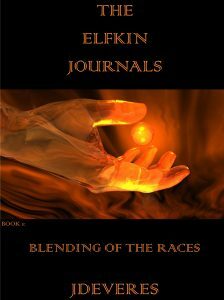 Author of “The Elfkin Journals – Blending of the Races”… book #1 in an initial fantasy/science fiction trilogy that invites readers to open their minds and stretch their imaginations… while addressing the very real and poignant non-fiction aspects of life that need to be addressed in any quality fiction manuscript! After decades of producing professional “IT related” technical papers, manuals and documents… as well as writing a variety of magazine articles covering everything from celebrity interviews to travel tips… JDeVereS published his first full-length fantasy book “The Elfkin Journals” in 2018. His passion for creating fiction is predicated on his belief that the only way to teach sound life principles is in the entertaining and engaging format of fantasy/science fiction.